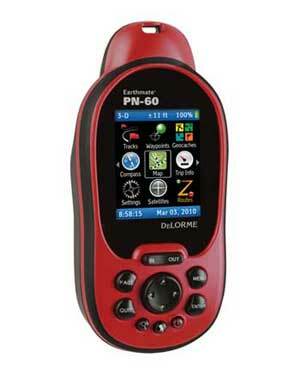 The rugged, reliable Earthmate PN-60 delivers next-generation GPS capabilities, plus DeLorme's market-leading map and aerial imagery displays. DeLorme Topo North America desktop software and GPS maps are included, with comprehensive detail for all your favorite outdoor activities in the U.S and Canada. Aerial imagery, nautical charts, and supplemental USGS and Canada topo maps are also available. Next-generation GPS capabilities, plus DeLorme's market-leading map and aerial imagery displays. Tested in the world's most extreme conditions. Find your position on up-to-date DeLorme Topo USA 9.0 maps. View cutaway elevation profiles with your position pinpointed.